Next, there is the 1964 novel written by then Doctor Who story editor David Whitaker that is nearly as good. This is the original Doctor Who novel, of which there eventually would be hundreds. While it clearly is the same Doctor as the teleplay, it is decidedly not canon in several aspects for interesting reasons. Since Doctor Who is hardly the institution it is now, it does not assume any knowledge of the television show format and skips over the television origin story. Instead, it spends its first three chapters talking about the meeting of Ian Chesterton, unemployed engineer, and Barbara Wright, teacher and private tutor, with Susan Foreman and her grandfather, the Doctor, at an automobile wreck on a foggy Barnes Common. It then tells an expanded version of the story of the teleplay in the first person, from Ian’s point of view, using a few additional ideas that were discussed for the serial but could not work within the budget, like a glass Emperor Dalek. Finally, there is the movie Dr. Who & The Daleks with a screenplay by producer Milton Subotsky (and uncredited help from David Whitaker). It tells much the same story as the teleplay and the novel, but it is neither canon nor really the same Doctor. It and a movie sequel exist in their own Who Universe, to the point that there are Doctor Who fans today who say “The Doctor is the character played by twelve actors the BBC since 1963; Dr. Who is played by Peter Cushing in two Dalek movies in the 1960s.” This is the story of human inventor Dr. Who (Cushing) and his two granddaughters, Susan and Barbara, who go on a seriocomic adventure with Barbara’s new boyfriend, Ian. Though not awful, it is the worst of the three adaptations. We’ve taken Terry Nation’s first seven episodes of the tv serial and re-written them into a screenplay, at the same time injecting a considerable amount of comedy. On tv, they take themselves so deadly seriously. This is all action, excitement and comedy. We intend to full use of the colour, spectacle, and action that make the difference between large and small screen entertainment. One of the things we have to make it different and better is splendour. Injecting comedy into a story that’s fairly hard science fiction with overtones of a Dalek master race and nuclear Armageddon less than a generation after World War II and shortly after the Cuban Missile crisis requires a deft touch. In the hands of Subotsky, the story loses a lot of its narrative guts and becomes something much more generic. Producer Verity Lambert and script editor David Whitaker felt you could create a popular children’s television entertainment without talking down to them. This film takes the same plot and some of the same dialogue and produces something that is strictly lowest common denominator. It completely emasculates the character of the Doctor. In the series, the Doctor is not yet the leading man anti-hero he would eventually become. That character is years away. He’s a trickster and a force of nature. He’s effectively kidnapped two schoolteachers against their will and cannot or will not return them home. He is an abrasive old man one minute, and something that could turn into the hero we see today the next. In recent days, the show has said “Rule #1: the Doctor lies” with the understanding that the Doctor is ultimately good and sometimes does what he must. There is no such understanding here. In this story, the Doctor lies and puts himself and all his companions in real jeopardy to satisfy a selfish whim. William Hartnell plays this with gleeful gusto in the TV serial. The look he shoots the camera as he deceives his companions and fakes a malfunction of the TARDIS is masterful. Peter Cushing is a terrific actor. He’s played Sherlock Holmes, Victor Frankenstein, and Grand Moff Tarkin; he can be the hero, the villain, and both at the same time. If there is anyone who could give a more layered interpretation of what William Hartnell did in 1965, it would be him. Yet, he is given nothing. In the hands of Milton Subotsky, Dr. Who is merely an eccentric, sometimes absent-minded human scientist and inventor. To be fair, the back story of the Doctor is an open question at this point. There is no Gallifrey and there are no Time Lords, much less the Doctor having two hearts and the ability to regenerate. One of the original concepts of the character gave the Doctor a human origin, albeit from far in the future. There are still dramatic possibilities to be found in that premise, but the screenplay explores none of them. It’s Dr. Who in the living room, Dr. Who meeting his granddaughter Barbara’s pratfall-prone boyfriend Ian, Dr. Who showing Ian his latest invention called TARDIS, and the adventure begins. We get nothing particularly dramatic about Dr. Who here. Peter Haining is kind to Cushing in his book Doctor Who: A Celebration: Twenty Years Through Time And Space. He calls Cushing’s Dr. Who “The Forgotten Doctor.” He also attributes to Dr. Who many of the warm, gentle characteristics that people would eventually see when Patrick Troughton took over the role. That is only sort of true. He has less rough edges, yes, but he’s also got less of pretty much everything. What he does have is more of the hero’s role. Some bits of business that fall to the younger, more dashing Ian in the teleplay and the novel are now given to him. The title role in the film is more central and conventional, and that is a direction the character was only starting to take on television at the time. That’s the role, but what of the performance? Cushing does a good job with what he’s given. He generates a decidedly distinct physical performance from what Hartnell does on TV; his bent over gait, his mannerisms, his way of moving through a scene is completely his own. There is some wonderful, childlike curiosity. The malfunction of the TARDIS also plays out as more of a child’s fib than anything with real menace. 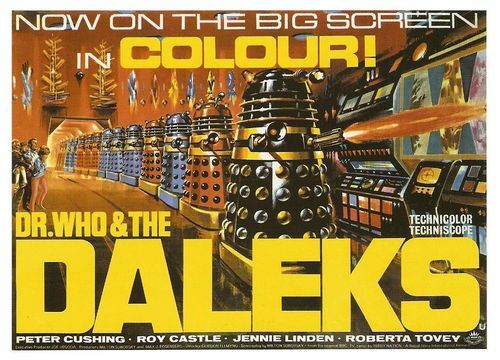 Yet when it becomes clear that the Daleks must be fought, the leading man core in Cushing’s performance is there. Our real star of the film is Bill Constable, who designed the sets. It’s probably the world’s first plastic set — it’s all plastic, but it looks metallic. We used all sorts of new materials. How metallic the set looks is debatable. The goal of the production design is not; where Doctor Who is low resolution black and white video at home, it’s bright Technicolor and Techniscope here. Color production stills of the BBC Dalek city show that the set was primarily metallic gray, and that the Daleks themselves were primarily in blue and gray livery. Here, the Daleks are a number of different colors, nearly all of them bright and shiny, and their movie city is predominantly pink. If that is the bad of this film, what is the good? The film operates on a budget that the television show can only dream of. The original BBC serial only had four real Dalek props and scenes calling for more than that used cardboard cutouts in the background to make up the difference. The movie used the same prop company (Shawcraft) as the BBC to manufacture eight “hero” Dalek props, and then contracted with the Shepperton studio plaster shop for another 10 Dalek “extras”. This creates more genuinely dramatic opportunities for the Daleks to interact, because there are enough props for rooms in the Dalek city to look populated. This something that fans of the show would only see in TV21 comics for some time to come. Beyond that, things fall apart pretty quickly. Comparing the visual design of the serial and the movie show how the designers and producers at the BBC were masters at doing more with less. The design of the movie TARDIS control room is a vastly inferior mess compared to the iconic BBC design. Yes, the petrified forest of the movie is bigger but the action in it is less effective. The pink city and the lava lamps (yes, there are lava lamps) make great use of the Technicolor palate, but date the look of the film quickly. Cutting the running time of the story from eight 24-minute episodes to an 83-minute film removes some of the tedium of the Ian and Barbara’s journey over the mountains with the Thals, but also gives less screen time to the Daleks. That’s a mistake, because the bright, shiny, colorful Daleks are the real stars of the show here. I think this film has significance because it was a visual record of the Hartnell era show when no other records were widely available. Prior to the 1989 release of “The Daleks” on VHS home video, there were only three ways to see William Hartnell stories: either go to a Doctor Who convention, see the special event repeats of old episodes and serials on the BBC or hope that whatever local station that plays Doctor Who (outside the UK) actually bothers to show serials from the 1960s. I fell into none of these categories from about 1979 to 1986, and was enjoying Doctor Who somewhat vicariously through novels and issues of Doctor Who Magazine. Yet, I was able to first see this film in the mid-1980s on late, late night television. With the film getting a Blu-ray remaster in 2013 and the BBC serial “The Daleks” now available on Hulu, we truly live in privileged times. Consciously or not, I believe this film and its sequel also have significance because they created certain ideas about how the Daleks should be shown that can never completely go away. 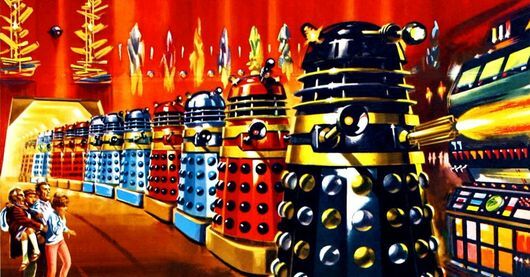 If you look at Steven Moffat‘s Dalek re-design at the end of “Victory of the Daleks,” you get four very tall, brightly colored new Daleks with large bumpers and dome lights. According to online sources, Moffat intentionally created them with the movies, not television, as a reference point. Aside from that, there can only be memories and unanswerable questions. As soon as I saw that John Hurt was cast as the War Doctor, I could only wonder what Peter Cushing would do with that role. Cushing died in 1994, at the age of 81. Yet, if any actor associated with the role of the Doctor needed to be brought into the canonical fold, it is him. With those piercing eyes and his dramatic gravitas, he would have been marvelous. Peter Haining’s book relates that Cushing himself was glad he took on the role; so much of his film work in those days was straight up horror and the Dr. Who films gave him a role where children welcomed him with open arms, not scared uncertainty. That reaction has the real character of the Doctor written all over it.